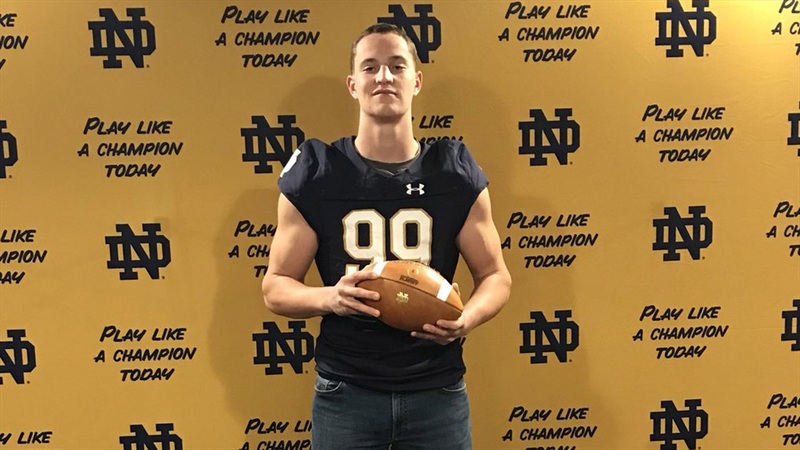 Alexander Ehrenesberger’s visit to Notre Dame last fall resulted in the 2020 German defensive end landing a scholarship offer from the Irish. And that offer resulted in the Irish landing a verbal commitment from the 6-foot-7, 240-pound junior earlier this week. The Dusseldorf native said he knew the basics about Notre Dame prior to the trip, but learned much more afterward. Mike Elston helped school the German on the Irish. Elston made the trip over to Europe to check in on Ehrensberger earlier in the week. Ehrensberger is looking forward to helping Notre Dame when he arrives prior to the 2020 season. “I think I might be able to bring a different mindset from Germany, from Europe; a mentality, leadership, physicality, hard work and work ethic,” he said. He spent about six months in the United States as a 10th-grader at Fryeburg Academy in Maine, so he has experience playing against Americans. “I think the change won’t too tough for me, but will definitely be something I’ll get used to,” he said. He also said he doesn’t think the differences between playing in the States and in Europe are as great as some may think. “You can compete in Germany on a high level of football and the differences aren’t tremendous,” he said. There has been an influx of European players in the college game recently and Ehrensberger is hoping to help put Germany on the college football map. Brandon Collier and his company, PPI Recruits, have helped Ehrensberger and several other players overseas learn the game and gain exposure. 2020 Irish quarterback commit Drew Pyne has already reached out to Ehrensberger, who is looking forward to building relationships with his future teammates. He’s followed college and pro games in America. His favorite player is Chargers defensive end Joey Bosa and his favorite team is the Los Angeles Rams, so he’s excited for the Super Bowl, which he will “no doubt” watch.